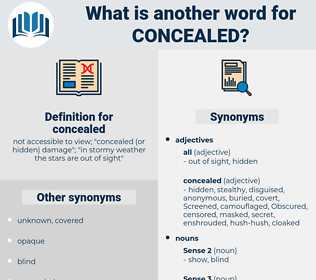 What is another word for concealed? 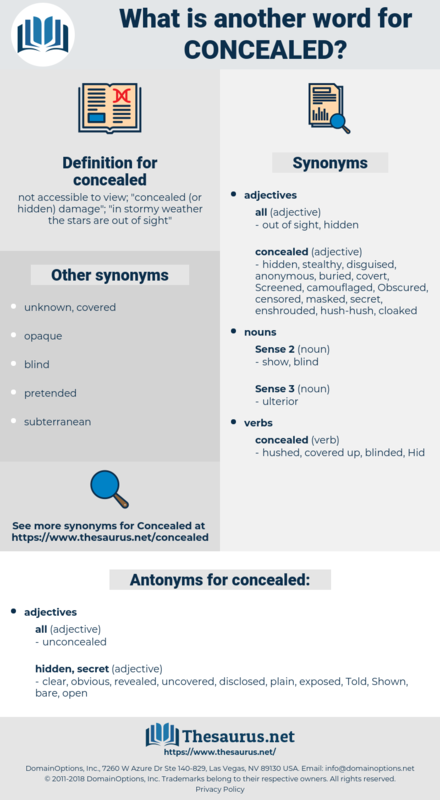 not accessible to view; " concealed ( or hidden) damage"; " in stormy weather the stars are out of sight"
Infiltrated, Hid, hides, camouflaged, exposed, cloaked, covered, lessened, Accommodated, silenced, colored, ignored, obstructed, Overshadowed, Obscured, neglected, Detained, undiscovered, withheld, Deleted, overlooked, masked, suppressed, released, veiled, confounded, blocked, discarded, Told, Eclipsed, shielded, cached, stashed, implied, planted, known, Lodged, Omitted, offset, failed, eased, embedded, kept, stored, buried, swept, stuck, dropped, Housed, tucked, missed, found, taken, hosted, hidden. clear, obvious, revealed, uncovered, disclosed, plain, exposed, Told, Shown, bare, open. The faithful old grandmother concealed her for a long time at great risk to them both, during which time she tried in vain to buy free papers for her. There the page was turned down, and the explanation was concealed from me.